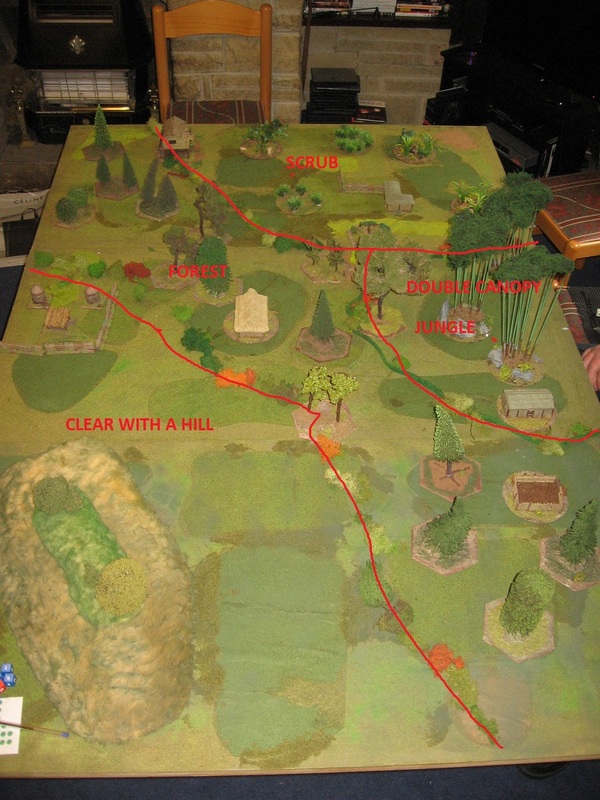 Our gaming group are big fans of the 2 Hour Wargames reaction system, however Evan ran a game based on the end battle in Saving Private Ryan and we ran into difficulties on how to do ambush style scenarios. 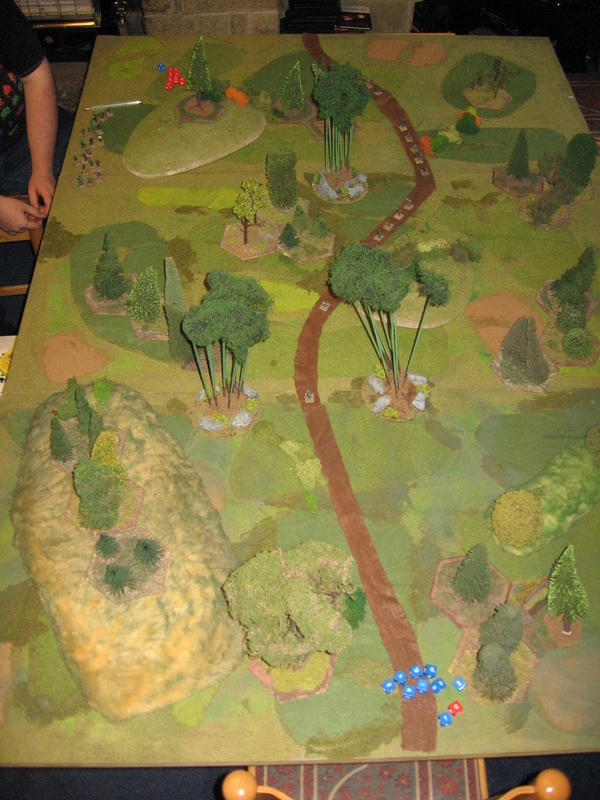 I know their is a school of though that says just set the scenario to start just after the ambush has been triggered- with the initial burst of fire occurring prior to the game’s start… Personally I wanted to have the ambush occur in game (not least because I’m working on a convoy game that will require it- more about that in another post). A quick brainstorming session later we had a house rule to be tested. Also I looked in FNG later on (the SPR game was run with NUTS! 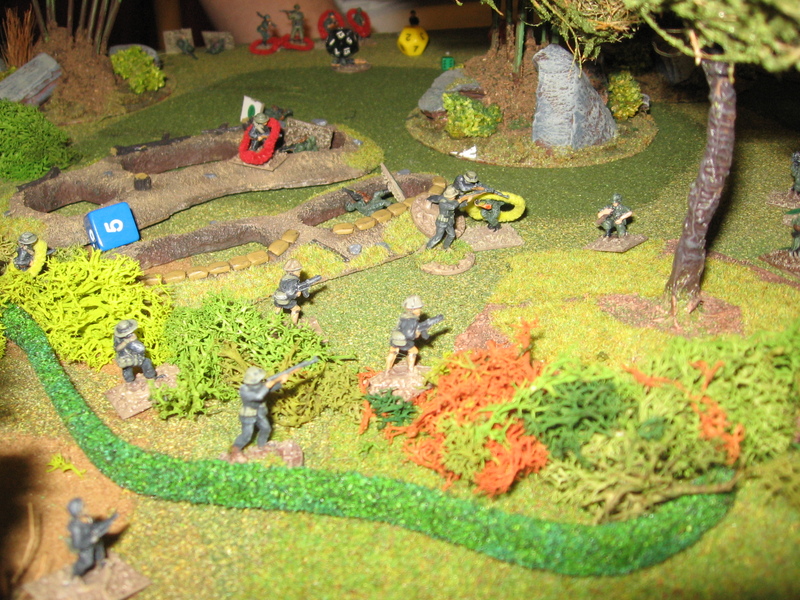 and we didn’t have a copy of the ‘Nam set handy at the time) and sure enough there is a system for Ambush scenarios in there. So we decided to run a simple scenario twice to see which way we preferred. 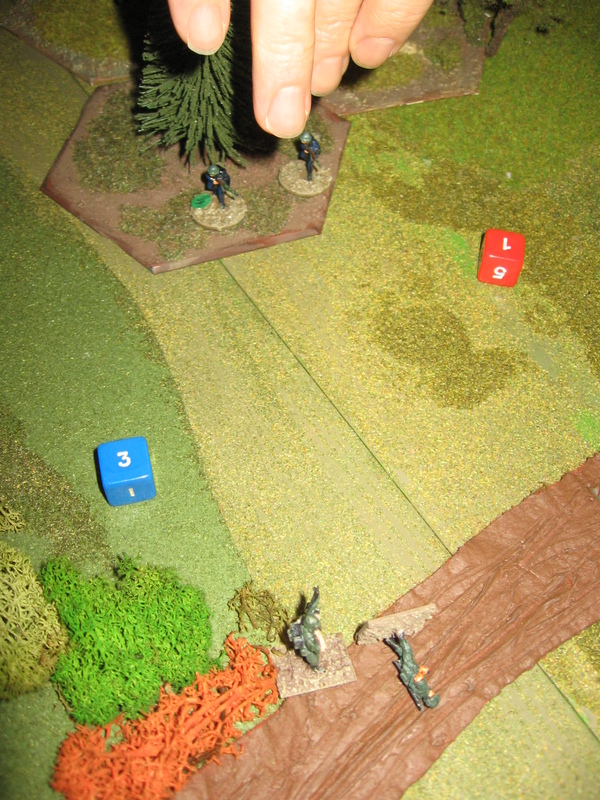 The FNG way is to have both the ambushers and ambushees start in sight of each other then just roll for turn start as usual to see who gets the drop on who. We felt that this way meant one side totally dominates the other. 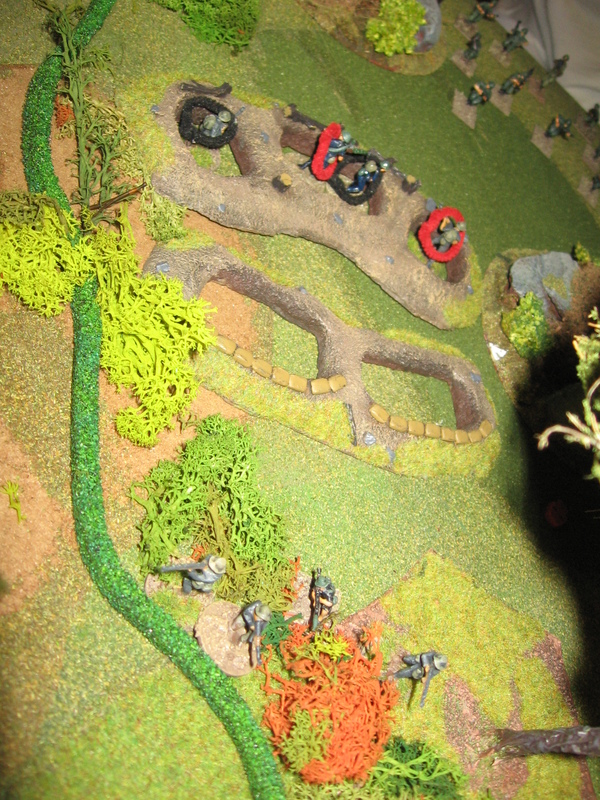 Our house rule is to have the ambushees as the active player and the ambushers as inactive, then do a mass in sight test for all the units who can see as per CR3.0. This way the firing order was a bit more mixed. 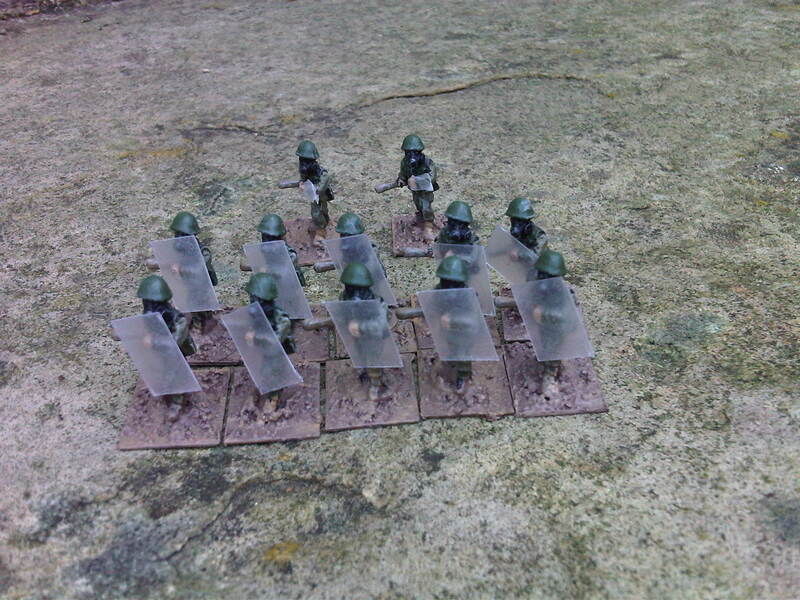 The twist we gave it is a few of the ambushing units (a number defined by the scenario) don’t have to roll under their REP to fire to reflect that they are prepared and set up properly. 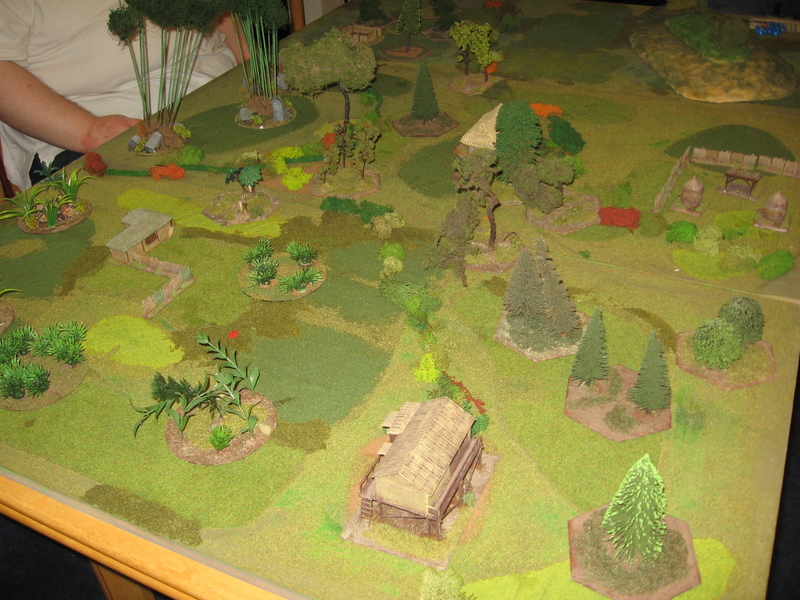 A long shot of the table for the 2 games. 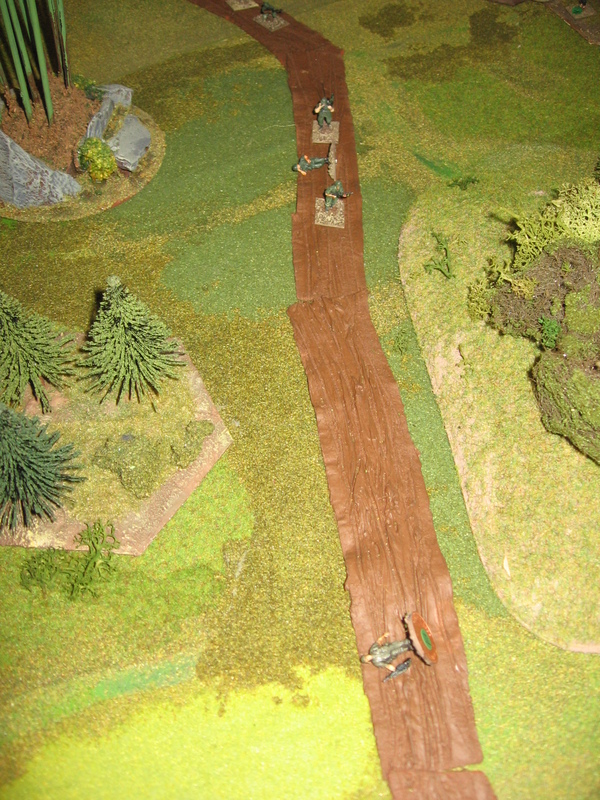 The US infantry were spread along the trail in 4 groups. 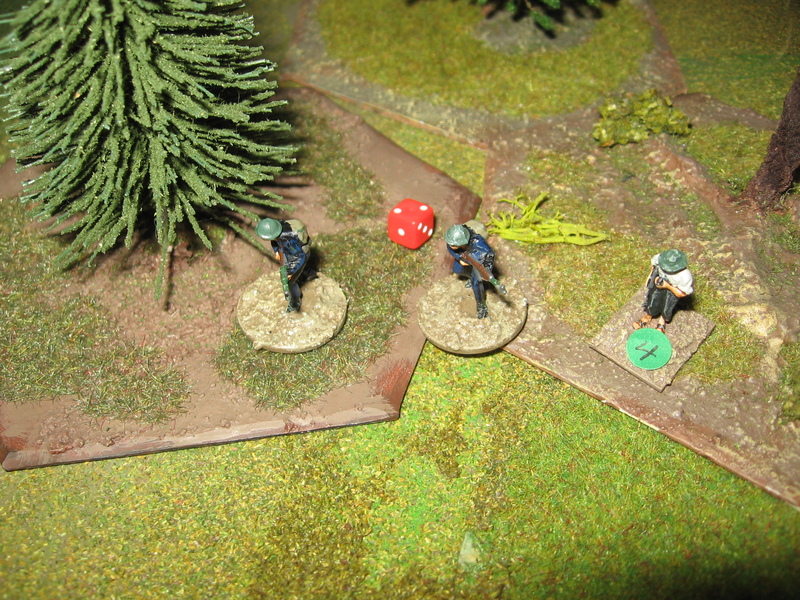 The Main Force VC set up second as the ambushers. 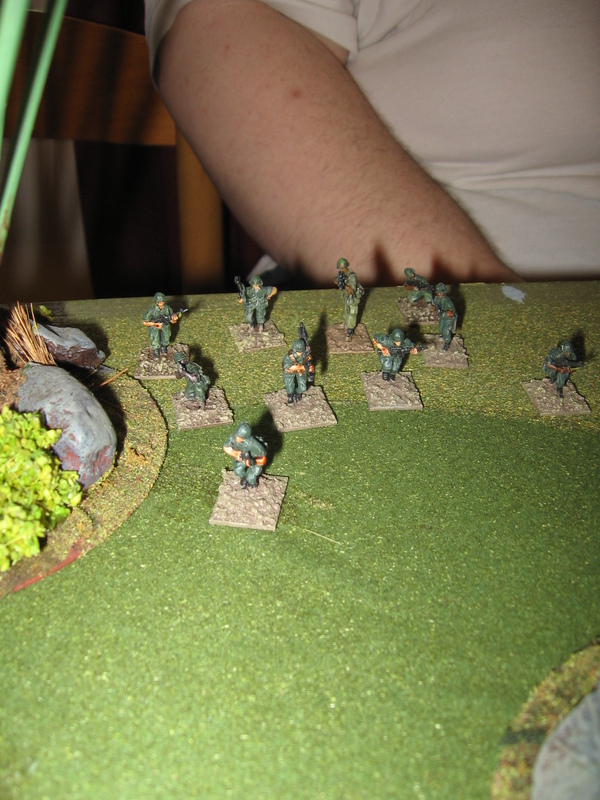 The grunts move up unaware. 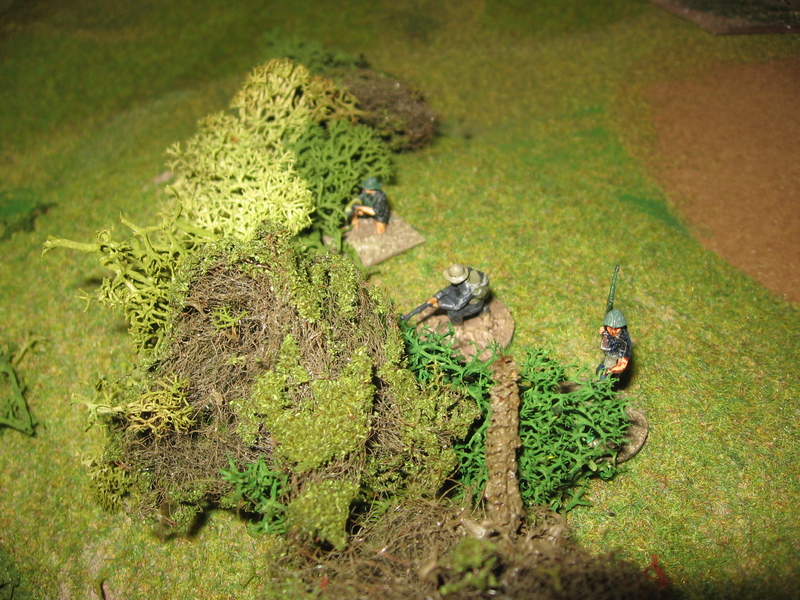 VC hidden in the bushes ready to attack. 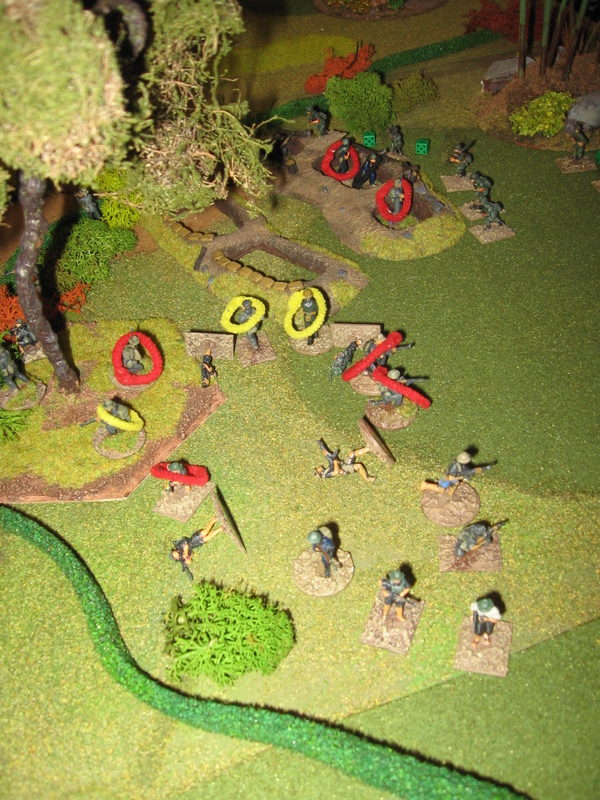 When we ran the game the first time the VC fired first and devastated the US patrol- every group engaged was wiped out. 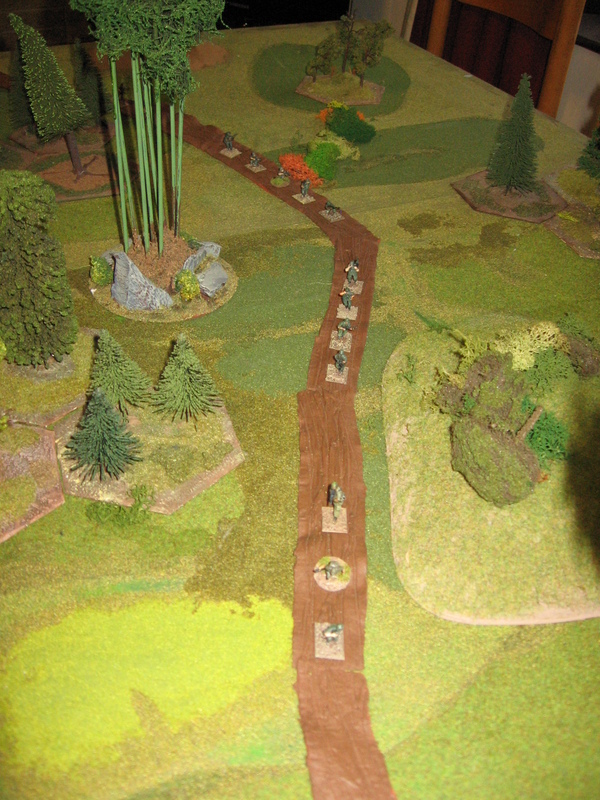 The second time we ran the scenario one group of US managed to get to fire mid ambush- ie 1 group of VC got to fire first, the 2 groups of VC and 1 US group all fired simultaneously . 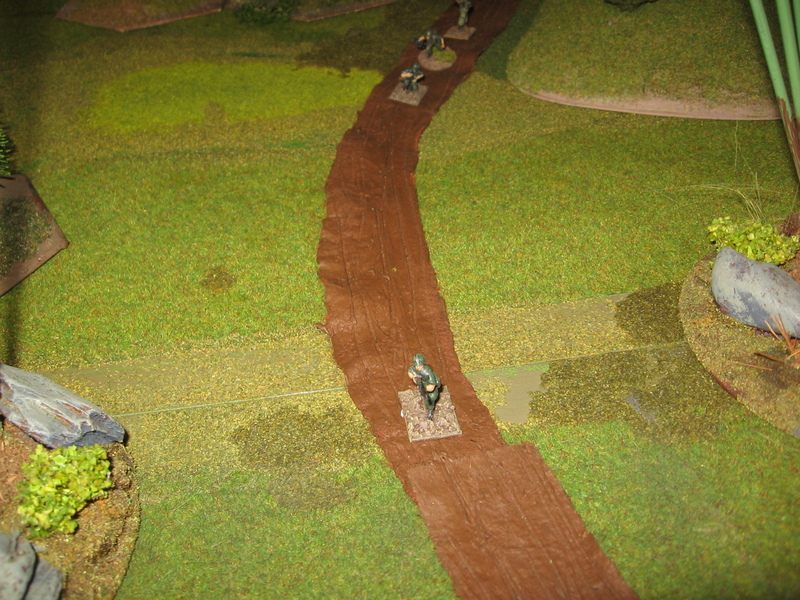 The still meant that 2 of the 4 US groups were taken out but the ambush wasn’t as certain. 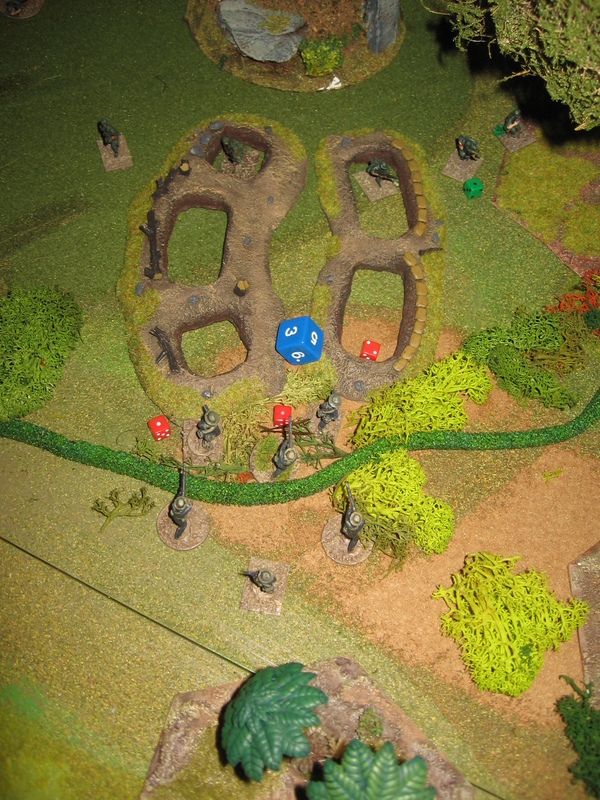 Give the deadly nature of such scenarios anyone considering one should think very carefully at the design state and severely limit the number of attacking units, and or have a large reserve for the ambushed player to call up either off table of out of the ambush zone. 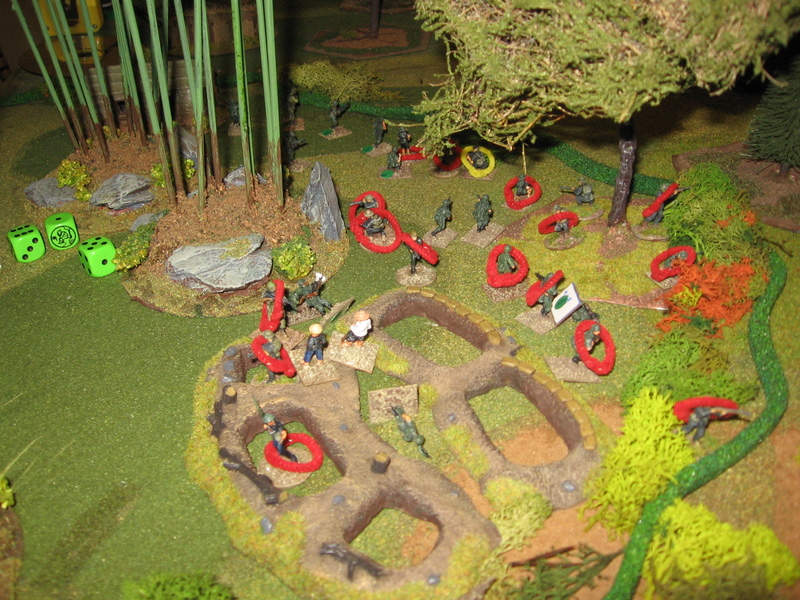 US troops get activated mid ambush. 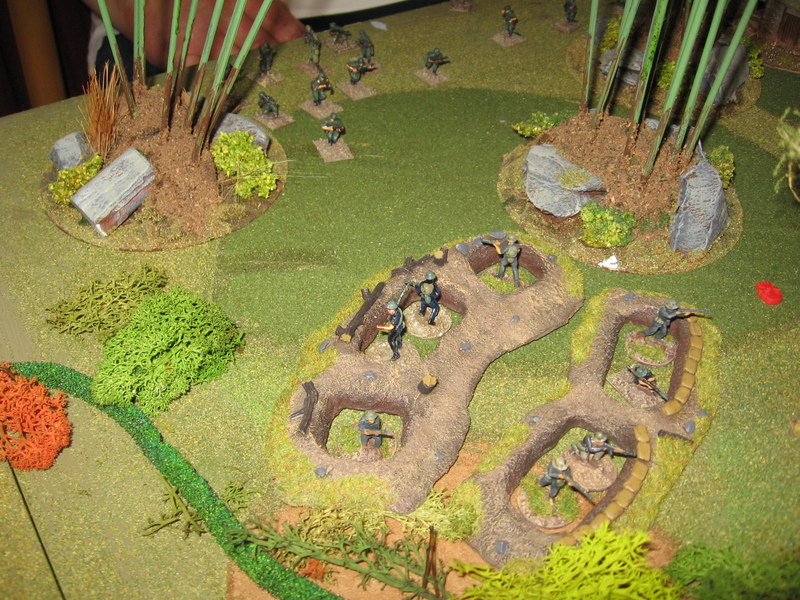 VC shoot into the attacking column. Charlie spotted- time to charge in. 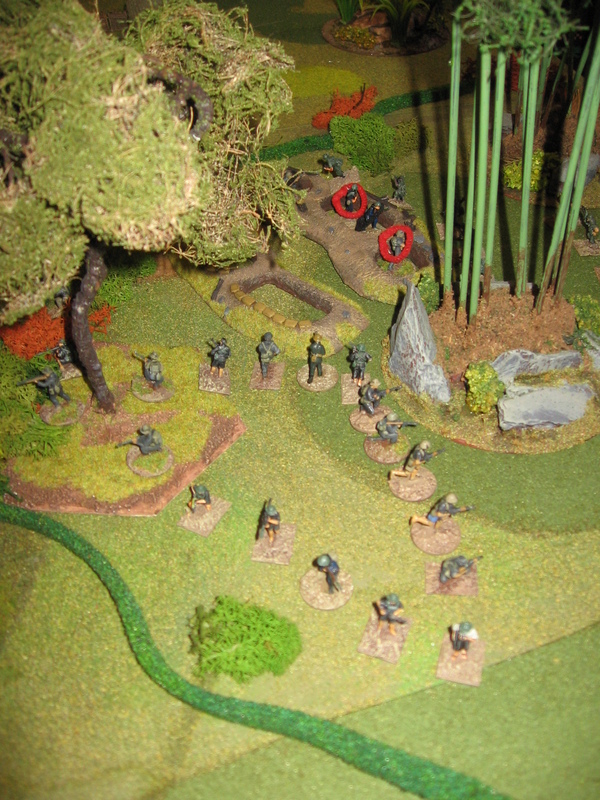 After a messy melee the remaining MFVC legs it out the back of the copse. 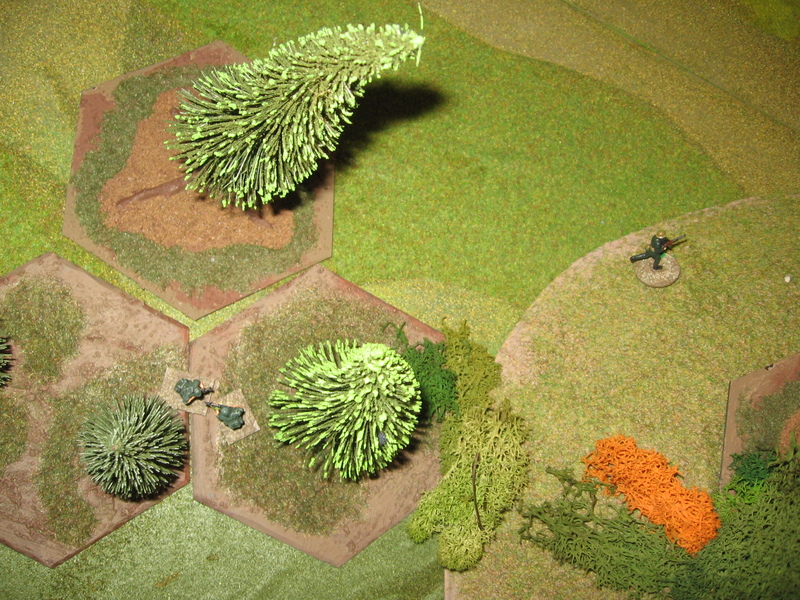 All in all an instructive few games- certainly given plenty for us to think about in terms of scenario design. 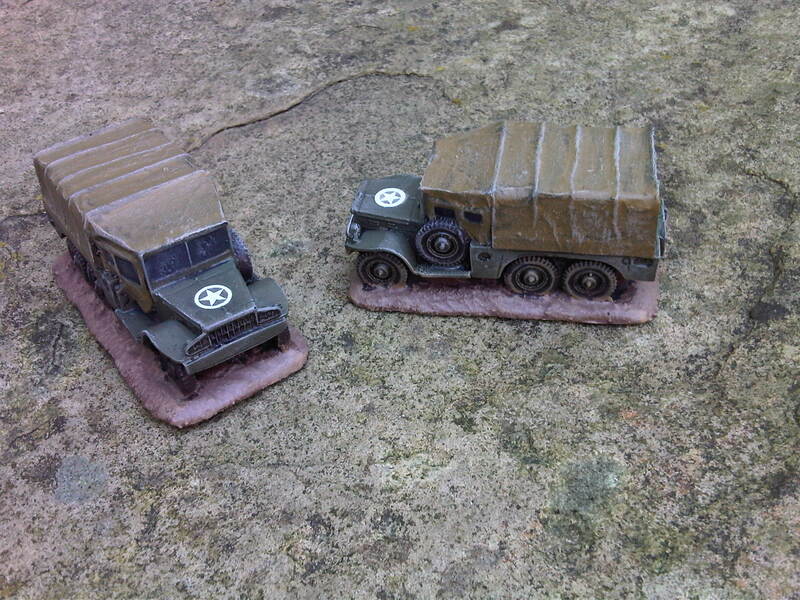 Watch this space for the convoy game too as well as some other ideas I’ve got brewing. 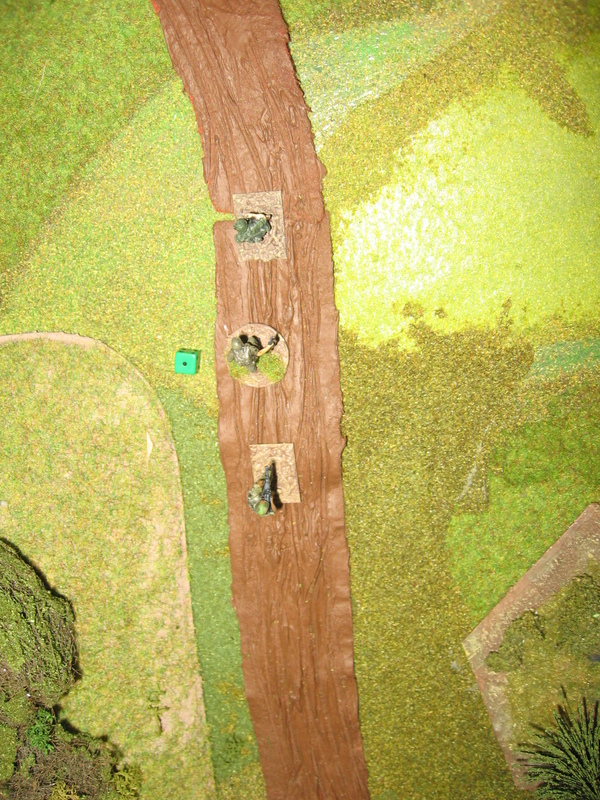 Our group have decided to use the house rule in similar games in the future. I’d be interested to see what everyone else makes of our ideas. Right bit of a heavy month- had a birthday so got a load of stuff from that- which was nice. 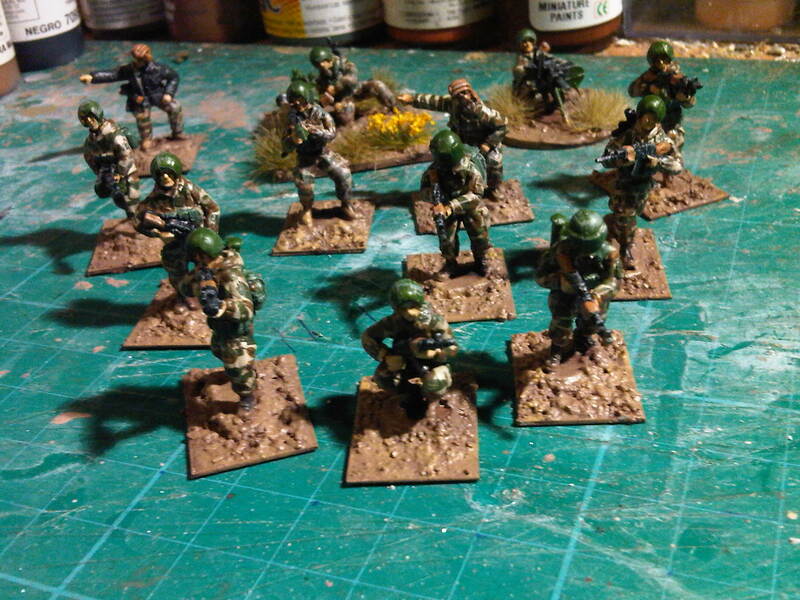 Figures: Acquired 155 20mms, painted 252. 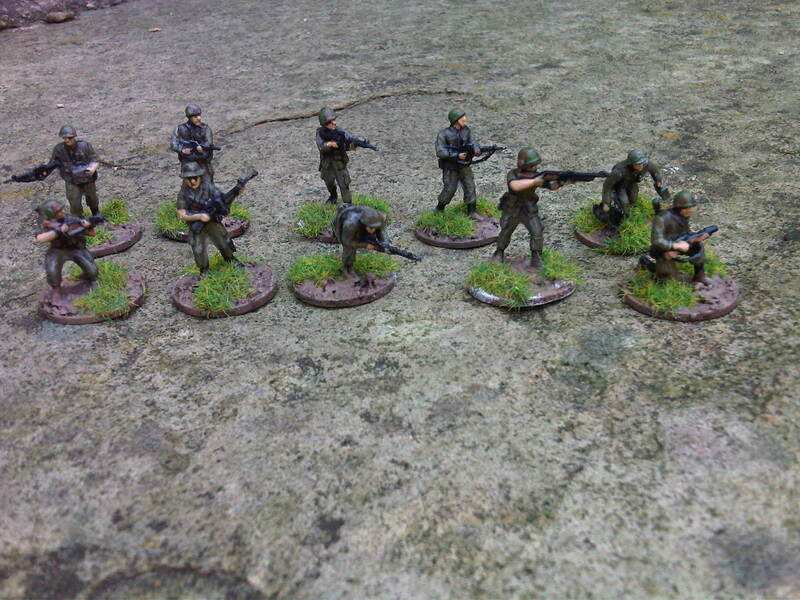 Kits Acquired 27 painted 25, Books got- 38 Read 31. Need to up my averages…. 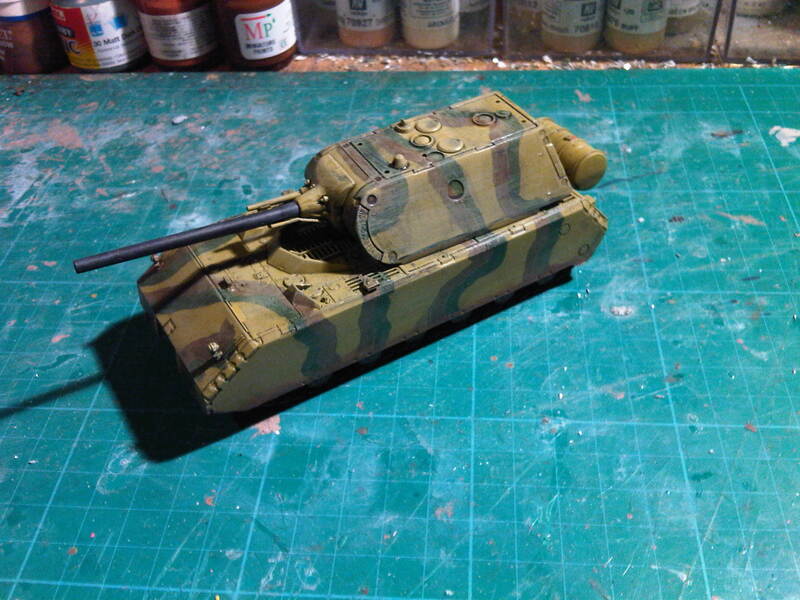 That said it doesn’t include a big batch of 1/600th aircraft I got done. 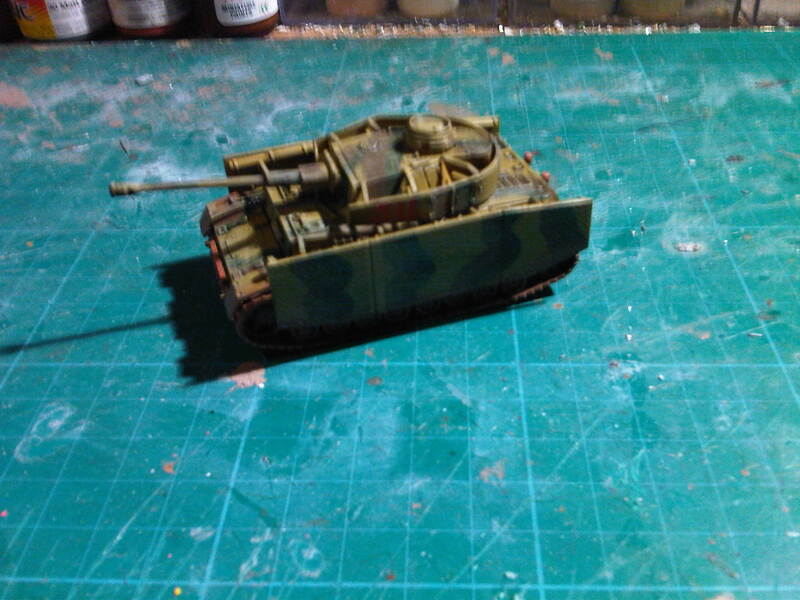 Other than that the lack of AARs is explained that we are breaking in a new player to the 2 Hour Wargames rules so the games have been quite short so no pics taken. 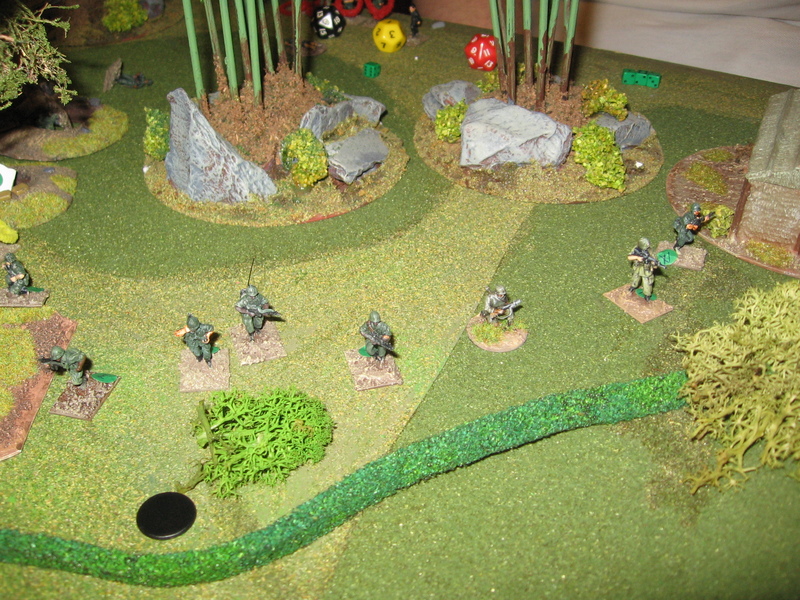 Also I’m trying to resist 1/1200 Naval after reading the rules for the Fletcher Pratt Naval game, my floor carpet is blue to….